Tesla founder Elon Musk today announced an over-the-air (OTA) software upgrade for all Model S sedans that not only tracks charging station locations but alerts drivers when they're out of range of those stations. A fully-charged Tesla Model S can travel around 200 miles. Superchargers, or electrical charging stations that more quickly recharge Tesla batteries, can deliver a half-charged battery in about 20 minutes. The new features come as part of Tesla's 6.2 version OS. Musk also announced Version 7 of the software that will automate steering. 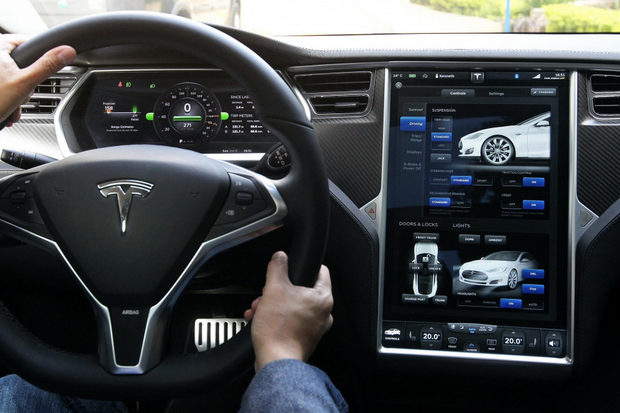 The Tesla Model S's 17-in infotainment system display and instrument cluser. "We're now almost able to travel from San Francisco to Seattle with the driver barely touching the wheel at all," he said during a conference call today. The Auto Steering and a Valet features -- the latter allows drivers to summon their cars while on their private property -- are expected to launch within three months, he said. The Valet Mode will be a smartphone app that will allow owners to request their car meet them at their front door, or park at the end of the day. "We designed the Model S to be a sophisticated computer on wheels. Tesla is a software company as much as it is a hardware company. That's a huge part of what Tesla is. It's the same way you're updating your phone or laptop: People have come to take it to be normal that your phone and laptop will keep improving. That's the approach we've taken with the Model S."
Earlier this week, Musk announced via Twitter a planned over-the-air update to address what he called "range anxiety" drivers were feeling. As part of the car's navigation system, the new Range Assurance application will always be running in the background, even when the nav system is not on. The Model S's head unit will communicate in real-time with Superchargers when in route to locations. It will also tell drivers where chargers are located or near their destination. Currently, Tesla has 430 Supercharging stations with 2,219 chargers throughout the U.S. and Canada. Additionally, the Range Assurance app will warn drivers when they're about to leave the range of a charging station and may risk running out of power. The app will be offered via OTA over the next year. A second upgrade with today's announcement is called "On Range Assurance, " which produces a map for drivers showing the most convenient charging locations, and directions on how to get there. The software also calculates how long it will take to achieve a high enough charge to reach a final destination. "It will be basically impossible to run out of charge unless you do so intentionally," Musk said.